This article is about the town in Lincolnshire. For other uses, see Horncastle (disambiguation). Horncastle is an English market town and civil parish in Lincolnshire, 17 miles (27 km) east of the county town of Lincoln. Horncastle had a population of 6,815 at the 2011 Census. Although fortified, Horncastle was not on any important Roman roads, which suggests that the River Bain was the principal route of access. Roman Horncastle has become known recently as Banovallum (i.e. Wall on the River Bain) – this name has been adopted by several local businesses and by the town's secondary modern school. But, the Roman name for the settlement is not definitely known: Banovallum was suggested in the 19th century through an interpretation of the Ravenna Cosmography, a 7th-century list of Roman towns and road-stations. Banovallum may have been Caistor. The Roman walls remain in places – one section is on display in the town's library, which was built over the top of the wall. The Saxons called the town Hyrnecastre, from which its modern name was derived. Horncastle is listed in the 1086 Domesday Book as consisting of 41 households, including 29 villagers and twelve smallholders, and had 100 acres (0 km2) of meadow and two mills, all belonging to King William. Dating from the 13th century prior to the Reformation, the Anglican parish church is dedicated to Saint Mary. In the Early English style, it is a Grade II*listed building. It was extensively restored between 1859 and 1861 by Ewan Christian. Four miles from Horncastle is the village of Winceby. During the 1643 Battle of Winceby – which helped to secure Lincolnshire for Parliament – leader Oliver Cromwell was almost killed. Local legend has it that the thirteen scythe blades, which hang on the wall of the south chapel of St. Mary's Church, were used as weapons at Winceby. This story is generally regarded as apocryphal. The accepted historical opinion is that they probably date from the Lincolnshire Rising of 1536. Both theories about the origin of the scythes are discussed at "Church History", Lincoln website. Horncastle was granted its market charter by the Crown in the 13th century. It was long known for its great August horse fair, an internationally famous annual trading event which continued to be held until the mid-20th century. It ended after the Second World War, when horses were generally no longer used for agriculture. The town is now known as a centre for the antiques trade. The great annual horse fair was probably first held in the 13th century. The fair used to last for a week or more every August. In the 19th century it was likely the largest event of its kind in the United Kingdom. The slogan, "Horncastle for horses", was an indication of the town's standing in this trade. George Borrow set some scenes of his semi-autobiographical books Lavengro and The Romany Rye at the annual horse fair. The last horse fair was held in 1948. In 1894 the Stanhope Memorial, designed by E. Lingen Barker, was erected in the centre of the Market Place in memory of Edward Stanhope MP. Built of limestone, red sandstone and pink and grey streaked marble, it is a Grade II listed structure. The Grade II listed Old Court House, built in 1865, is in the town centre, in Louth Road. Since the late 20th century, the population has increased to 6,815 in 2011, its highest ever. Historically, the civil parish suffered a decline in population from the mid-19th to mid-20th century, as urbanisation and changes in agriculture attracted people to cities where more work was available. Horncastle is twinned with Bonnétable, a ville de marché (market town) in the French département of Sarthe with a population of 4,000 (approximately). The towns' relationship is commemorated by a Rue Horncastle in Bonnétable, and a Bonnetable (sic; no acute accent on the 'e') Road in Horncastle. It lies to the south of the Lincolnshire Wolds, where the (north–south) River Bain meets the River Waring (from the east), and north of the West and Wildmore Fens. The south of Horncastle is called Cagthorpe. Langton Hill is to the west. It used to be part of Horncastle Rural District in the Parts of Lindsey, but is now in the district council of East Lindsey, based in Manby, east of Louth. North of the town, the civil parish meets West Ashby and Low Toynton, south of Milestone House on the A153 (Louth Road). The boundary skirts the east of the town, crossing Low Toynton Road, following the Viking Way then meeting the River Waring. It briefly follows north of the A158, to a caravan park, where it meets High Toynton. Southwards on Mareham Road it meets Mareham on the Hill, east of Stonehill Farm. South of the town, and north of Telegraph House, it meets Scrivelsby, following High Lane westwards to cross the B1183, south of Loxley Farm, then the A153 and skirts the southern edge of the sewage works next to the River Bain where it meets Roughton (Thornton). It follows the Old River Bain west of the A153 northwards over the river meadows, crossing the Horncastle Canal (and Viking Way). Eastwards it crosses the B1191, south of Langton Hill, where at Lowmoor Lane it meets Langton. It follows Langton Lane northwards, with Mill House Farm (Langton Mill) to the west, meeting Thimbleby. It meets the B1190 where the pylons cross the road then the A158 at the B1190 junction, briefly following Accommodation Road to the east. It skirts the north of the town, briefly following Elmhurst Road, passing south of Elmlea Farm. and straight through Elmhirst Lakes. At the River Bain near Hemingby Lane, it meets West Ashby. Lincolnshire Integrated Voluntary Emergency Service is based at the Boston Road Industrial Estate. The Lincolnshire Wildlife Trust is based in Banovallum House. Mortons of Horncastle is a major national magazine publisher of classic motorcycles, aviation and road transport heritage titles, situated in the south of the town on the industrial estate off the A153 (Boston Road). An electoral ward of the same name exists. This ward includes Thimbleby and has a total population taken at the 2011 Census of 7,073. Horncastle has always been a very safe area for the Conservative Party, except for two years in the early 1920s, when it had Liberal Party representation. It had its eponymous parliamentary constituency for 98 years from 1885 to 1983. It was then Gainsborough and Horncastle and since 1997, Louth and Horncastle. Henry Haslam served as MP during the Second World War and the five years of the Churchill Wartime Government. The veteran politician Sir Peter Tapsell was MP for the town from 1966 to 1983 and from 1997 to 2015, being Father of the House of Commons from 2010 to 2015. Following a redistribution of parliamentary constituencies, Edward Leigh was the MP from 1983 to 1997. Horncastle Primary School is situated at Bowl Alley Lane. Queen Elizabeth's Grammar School was founded in 1571, and is among the top schools in Lincolnshire; it has at times been one of the top schools in the country. Its tennis, hockey, netball and cricket teams compete regionally, and the tennis team was a regional winner in the 2005 British Schools Tennis Championships. Queen Elizabeth's is a specialist Science College and Language College. Its Design and Technology department recently entered two teams in the National 4X4 for Schools engineering competition, one of which came first nationally in its age group, while the other came second nationally overall. The Banovallum School is a non-selective community school serving Horncastle and the surrounding villages; it is a science specialist school on a joint basis with Queen Elizabeth's Grammar School. The most recent Ofsted inspection was in 2010 and judged the school to be overall Grade 2 (good). The school recently added a building with facilities for cookery, woodwork, metalwork, art and music. St Lawrence School is a special-needs school with a Lincolnshire-wide intake, and with St Bernard’s School, Louth, comprises the Lincolnshire Wolds Federation. Horncastle College is a "lifelong learning" adult education college, which runs short and residential courses in I.T., art, languages and local history. 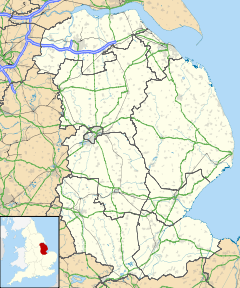 Horncastle sits at the crossroads of two of Lincolnshire's major roads: the A158 runs west to east, joining the county town of Lincoln with the resort of Skegness on the Lincolnshire coast; the A153 joins Louth in the north with Sleaford and Grantham in the south. These two roads meet at the "Bull Ring" in the centre of Horncastle. The A158 through Horncastle becomes busy during the summer holidays, as holidaymakers travel between Horncastle and Skegness. To alleviate pressure on the town centre caused by the traffic, a relief road, Jubilee Way, was constructed in the 1970s. Minor roads run from Horncastle to Bardney, Boston (via Revesby), Fulletby and Woodhall Spa. Horncastle is home to a hub for the InterConnect rural bus service. Regular buses run to Lincoln, Skegness and across the Wolds. The Viking Way long-distance footpath also runs through Horncastle. The Great Northern Railway's Lincoln–Boston line ran through Kirkstead, 8 miles (12.9 km) from Horncastle, and a branch line from Kirkstead (later renamed Woodhall Junction) through Woodhall Spa to Horncastle opened on 11 August 1855. The last passenger service ran in 1954, with complete closure to goods traffic in 1971. Horncastle railway station was demolished in the 1980s and the site is now a housing estate. Today the nearest railway station is Metheringham on the Peterborough to Lincoln Line. The Horncastle Branch was a line that ran from Woodhall Junction to Horncastle, and is now the Viking Way. Horncastle Canal, based upon the River Bain, was constructed from 1792 and opened in 1802. In 2004 it was suggested that the Horncastle Canal (originally opened in 1802) be renovated with the help of private capital, and promoted as a route for pleasure craft, as has successfully been achieved in other areas. A local kick-start programme raised money for the project. Horncastle Town FC play in the Lincolnshire Football League; their ground is on The Wong. The team is sponsored by a local skip hire company. The club has a Saturday reserve side, sponsored by a plastering company, and a Sunday side, sponsored by a public house. The club has a junior section with teams ranging from under-10s to under-18s, sponsored by a joinery firm. The club restructured before the 2008–09 season through the resignation of its manager and the loss of out-of-town players he brought to the club. Subsequently, the club decided to be more locally focused. Horncastle Town has achieved FA Charter Standard status. The town has a cricket club, which has two men's teams, and five youth squads. Both teams are sponsored by a pallet services group of companies. The town's hockey club currently made up of two men's teams and a ladies' team. The Men's 1st XI won the NE14HOCKEY East Men's League Division 5NW title in 2008. Following promotion in the 2009–10 season with a record of played 22, won 22, Horncastle Men's 1st team now play in Division 3(NW) of the East region. Horncastle Men's 2nd team play in Division 6NW(N) of the East region after finishing as runners-up in the 2009–10 season. The Horncastle Ladies won Division 1 of the Lincolnshire Women's Hockey League for 2010–11. The town is susceptible to flooding, notably in 1920 and 1960 – and with three floods occurring between 1981 and 1984. Folklore belief associates the occurrence of floods with the installation of new vicars in Horncastle's Anglican Church. The vicar changed in 1919 and 1959, both less than a year before a flood. The flooding of the early 1980s was attributed to the change of vicar in 1980; however, there was no flooding in Horncastle following the change of vicar in 1999. Both the River Bain and River Waring overflowed their banks during the 2007 United Kingdom floods. Flooding also occurred in 2012. A £15 million, 30-year-old proposed flood defence scheme was seen as unlikely to have prevented the 2012 flood, but new means of flood defences are being discussed. An anti-flood pump was installed in 2013. On 7 October 1960 Horncastle entered the UK Weather Records with a "highest 180-minute total" rainfall of 178 mm. As of March 2013[update] it still holds the record. The water levels are said to have risen 8 feet (2.4 m) as a consequence. Reverend William Blaxton (also spelled William Blackstone) (1595 – 26 May 1675) was an early English settler in New England and the first European settler of modern-day Boston and Rhode Island. Alfred, Lord Tennyson (1809–1892), Poet Laureate, was born six miles from Horncastle in the village of Somersby. Tennyson opined, "Of all horrors, a little country town seems to me to be the greatest." Arthur Thistlewood (1774–1820), radical and Cato Street conspirator, was baptised in Horncastle on 4 December 1774. Robert Webb (born 1972), actor and comedian, lived in Woodhall Spa, but attended school in Horncastle. ^ "Town population 2011". Retrieved 19 August 2015. ^ a b Historic England. "Bannovellum (352692)". PastScape. Retrieved 2 October 2010. ^ "Horncastle". Open Domesday. Anna Powell-Smith/University of Hull. Retrieved 23 October 2011. ^ Historic England. "St Marys Church, Horncastle (Grade II) (1168259)". National Heritage List for England. Retrieved 24 October 2011. ^ "Local web site, detailed account of civil war actions". Archived from the original on 25 January 2013. Retrieved 9 April 2011. ^ "Account of Lincolnshire Rising". Horncastle Discovered. Archived from the original on 12 July 2011. ^ "Church History". Lincoln. Retrieved 9 April 2011. ^ "Town Council details". Retrieved 9 April 2011. ^ "Horse fair details". Horncastle Discovered. Archived from the original on 12 July 2011. ^ Historic England. "Stanhope Memorial (1262721)". National Heritage List for England. Retrieved 23 October 2011. ^ "Vision of Britain". Retrieved 23 October 2011. ^ "Twinning association record". Archived from the original on 17 February 2012. Retrieved 9 April 2011. ^ "Twinning Assiciation site". Retrieved 9 April 2011. ^ "Ward population 2011". Retrieved 19 August 2015. ^ "Government record for primary school". Retrieved 9 April 2011. ^ "Government record for Grammar school". Retrieved 9 April 2011. ^ "Government record for Secondary school". Retrieved 9 April 2011. ^ "Special school web site". ^ "Horncastle College". Archived from the original on 19 May 2011. Retrieved 9 April 2011. ^ a b The Viking Way: Official Guidebook to the 147 Mile Long Distance Footpath Through Lincolnshire and Rutland. Lincolnshire Books. 1997. ISBN 1-872375-25-1. ^ Historic England. "Horncastle Station (499040)". PastScape. Retrieved 15 March 2013. ^ Historic England. "Horncastle railway (1365443)". PastScape. Retrieved 15 March 2013. ^ Historic England. "Horncastle Canal (892922)". PastScape. Retrieved 19 August 2010. ^ "Cash pours in for project to revitalise canal". Horncastle News. 5 February 2004. Retrieved 22 March 2013. ^ "Kickstart for canal". Horncastle News. 29 October 2003. Retrieved 22 March 2013. ^ a b c David N Robinson. "Horncastle and the Problem of Floods". The Old Chapel, Church Close, Boston, Lincolnshire PE21 6NP: Visitor UK Ltd. Retrieved 22 February 2013. ^ a b "Floods make national news". Horncastle News. 12 August 2012. Retrieved 22 March 2013. ^ "Lincolnshire clean-up operation after flash floods". News Lincolnshire. BBC. 29 June 2012. Retrieved 22 March 2013. ^ "£15m defence scheme will not stop town homes flooding". Horncastle News. 14 July 2012. Retrieved 22 March 2013. ^ "Major boost to Horncastle flood defences". Horncastle News. 3 March 2013. Retrieved 22 March 2013. ^ 1944-, Anderson, Robert Charles,. The great migration begins: immigrants to New England, 1620–1633. New England Historic Genealogical Society,. Boston. ISBN 088082042X. OCLC 33083117. ^ Brown, Anthony (2000). Ill-starred captains: Flinders and Baudin. Crawford House Pub. p. 489. ISBN 978-1-86333-192-0. ^ Malcolm Chase, "Thistlewood, Arthur (baptised 1774, died 1820)" (Oxford, UK: OUP, 2004) Retrieved 2 December 2016. Pay-walled. Wikisource has the text of the 1911 Encyclopædia Britannica article Horncastle.